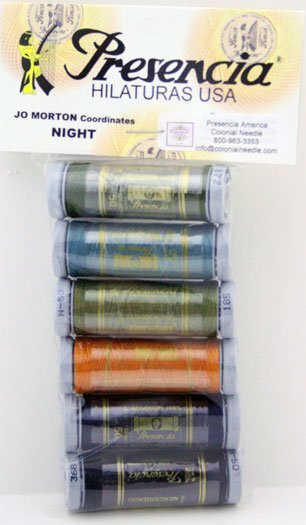 Night includes Deep Teal Blue Pewter 162, Dark Beaver Grey Brown 172, Olive Khaki Green 185, Deep Or. Pumpkin Gold 234, Very Very Dark Navy Blue 315, Dark Smokey Gray Black 368. 6 x 100 meter Presencia 50 weight 3-ply Cotton Thread.